Sortez de la ville et explorez la région sauvage de la Cappadoce lors de ce circuit de deux jours. 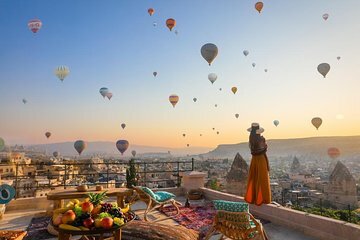 Envolez-vous d'Istanbul et partez avec votre guide pour visiter les principaux sites touristiques de la région, notamment la vallée du Devrent, Pasabag, Avanos, le musée en plein air de Göreme, la ville souterraine de Derinkuyu, etc. Profitez des repas locaux et de l'hébergement dans un hôtel troglodyte. Absolutely amazing tour, I booked last minute tour with Enka travel and they were outstanding over the 3 days I spent in Cappadocia. I didn't have to worry about a thing booking tbis tour everything from the moment I was picked up from my Istanbul hotel was organised and the travel agent was very professional, even offering 24/7 assistance and upgrading my hotel to luxury suite. The past 3 days have been incredible I highly recommend the hot air ballooning as its seriously breathtaking. Thank you so much for a brilliant 3 days in Cappadocia. The tour covered major places in Cappadocia in 2 days. The guide was knowledgeable and provided information about history, culture, religions, etc.